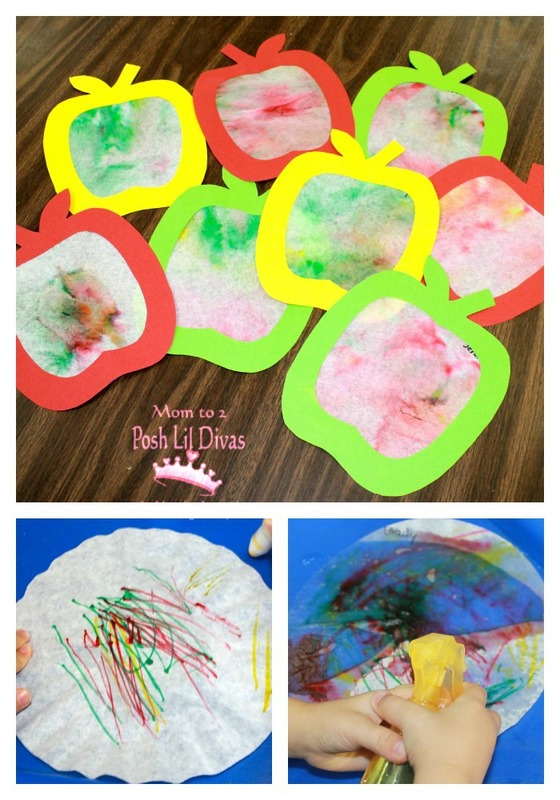 Last week in preschool we learned about apples. What a fun week we had tasting, counting, painting, exploring and reading about apples. It was a great way to kick off the official start of fall ( even if we don't really see or feel fall here in South FL). As always I try to incorporate art, science, math, fine motor activities, language and literacy in all of our themes. 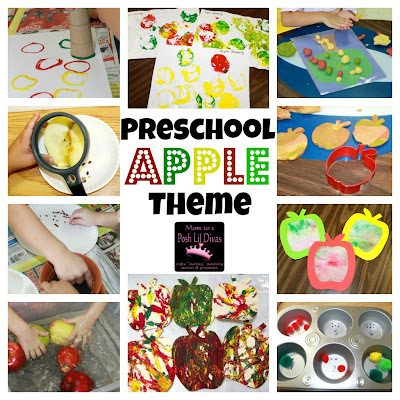 Here are some highlights from our apple themed week at preschool. The kids really enjoyed our coffee filter apple art. They all came out unique and it was fun to see how they all got into it - especially the water spraying part! For a full how to you can see my earlier post here. 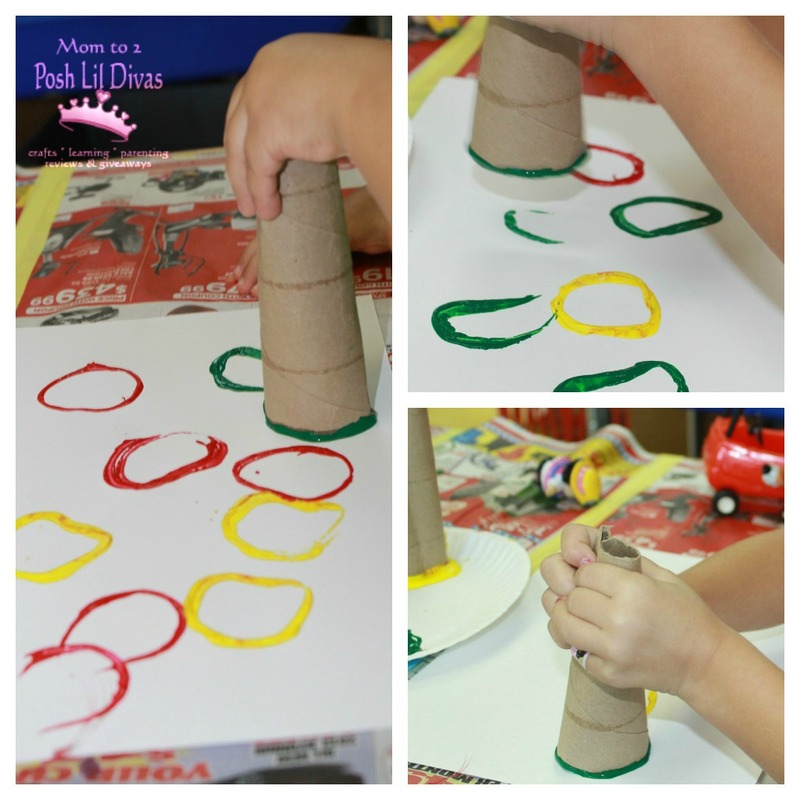 This was another super easy activity to set up. I took paper towel rolls, cut them in half and folded the middle in on one end so that they looked like an apple shape. I kept things simple so we didn't add stems or leaves but if you really want to do this up check out how Make and Takes did it - so easy and cute. 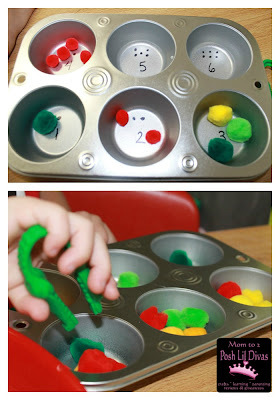 This muffin tin apple activity was great math practice for my preschoolers. I simply wrote the numbers 1-6 inside the cups and added dots for each. Then the children had to pick apples (pom poms) using our pincers and add the correct number to each cup in the muffin pan. The kids loved this experiment! I filled up a tub with water and asked the children if they thought our apples would sink or float when put into the tub of water. I made a chart and recorded all their answers then we conducted out little experiment. What did we find? 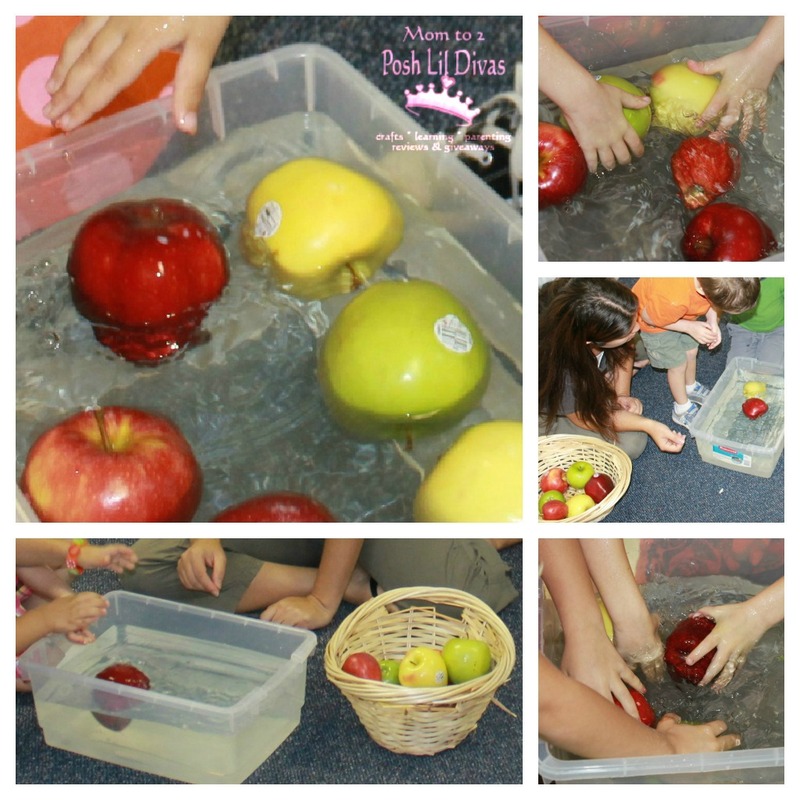 Our apples floated in the water. The kids were amazed - most of them thought our heavy apples would surely sink. After our experiment I cut open a red, green and yellow apple. 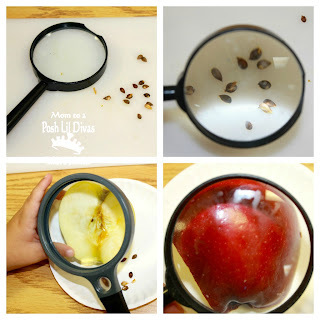 We found the apple star and counted all our seeds. We used magnifying glasses to look closely at the seeds, the apple skin and the fruit inside. After investigating our cut apples we stamped with them and made some fun apple printed art. This was lots of messy fun. 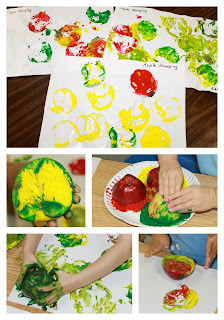 One of the kids favorite art projects for the week was apple roll painting. This was so much fun and our finished art was gorgeous. 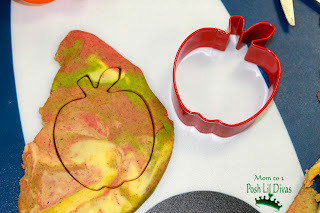 Using a cardboard box, I put an apple template inside with some red, green and yellow paint and added an apple. 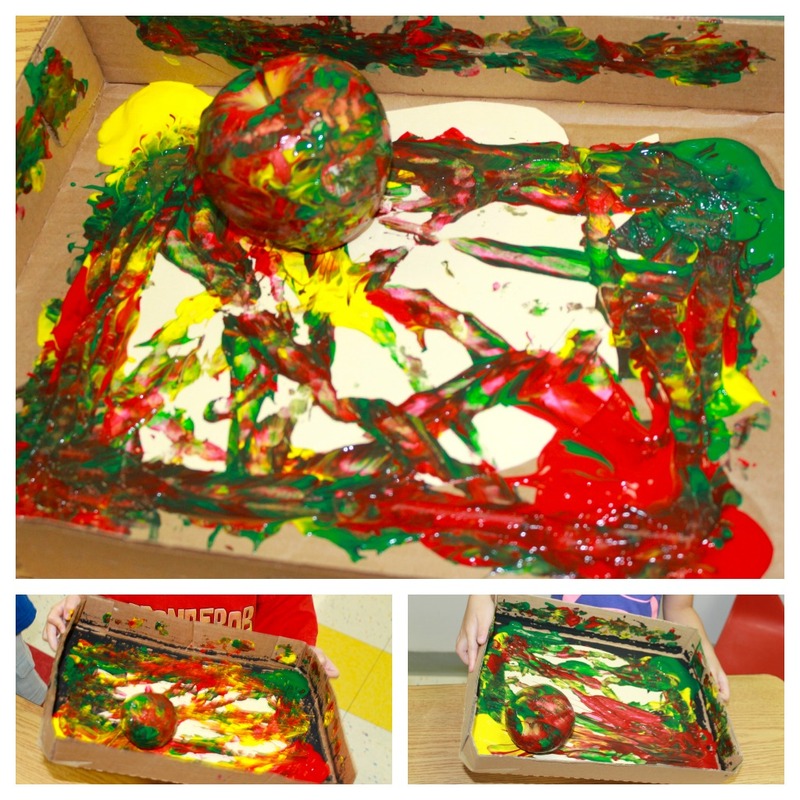 The children rolled the apple in the box making paint tracks on our apple template. Here is a peek at a few of the finished apples. It was such a fun process! I put aside the seeds from our apple investigation so that we could plant them and see what happens. 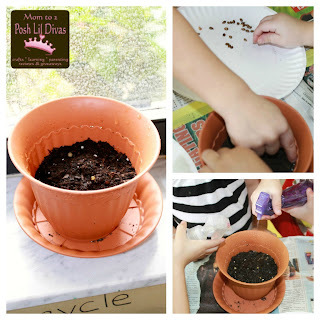 We are currently taking care of our potted seeds - fingers crossed. At the start of the week, I made cinnamon apple pie play dough in red, green and yellow. You can get the full recipe here. I cut out some trees from construction paper and the children rolled apples out of our play dough to put on the trees. 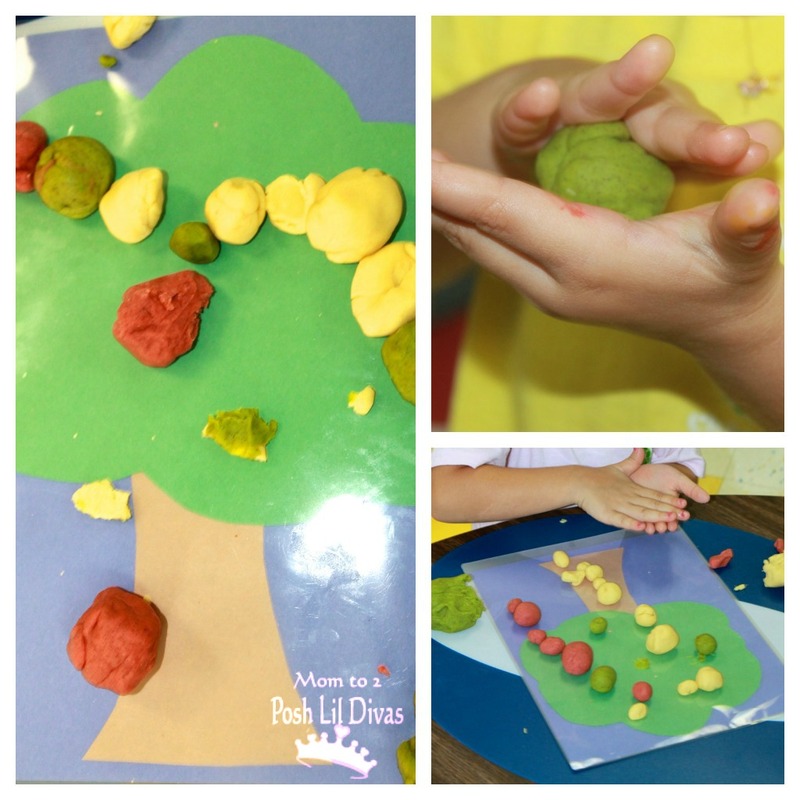 Mid week - our play dough had mixed and swirled so that it looked marbled. We used cookie cutters to make apples shapes and I think they turned out pretty cool. At the end of the week we had an apple tasting of red, green and yellow apples. The children tried all 3 apples and we graphed their favorites on a chart. It was a fabulous apple filled week! 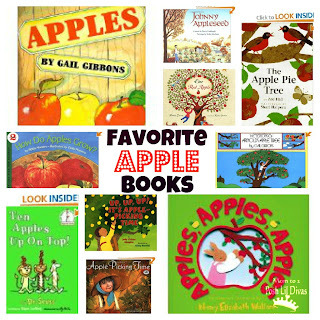 and here are 10 of our favorite apple themed books for you to read to your littles. Need even more ideas? 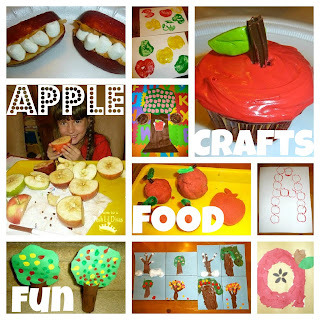 Check out my Apple Fun Pinterest board - it has tons of ideas for all ages. Nice collection of apple themed activities! Thanks for sharing. You should also check out www.p2games.co.uk, they have so many great apps for kids! Like the apple play dough recipe!!! It seems my preschool in Washington always has a fun idea of what to do. There doing something very similar this upcoming fall.